A month has passed since Victoria gave birth, but she’s still being treated like an invalid. They’re even wheeling her around the palace in a wheelchair, which she finally deems to ridiculous for words. This woman wants to be free! Albert’s been running things in her absence, and he doesn’t seem all too keen to hand the reins of power back over, no matter what she says. He practically pats her on the head every time she asks for an update, which infuriates her to no end. Understandable! She sees this as a slip back into the days when she had no power at all, and people like Conroy were lording over her and we know Victoria is NOT ok with that. But, in this world of men, a mother’s place is in her child’s nursery. 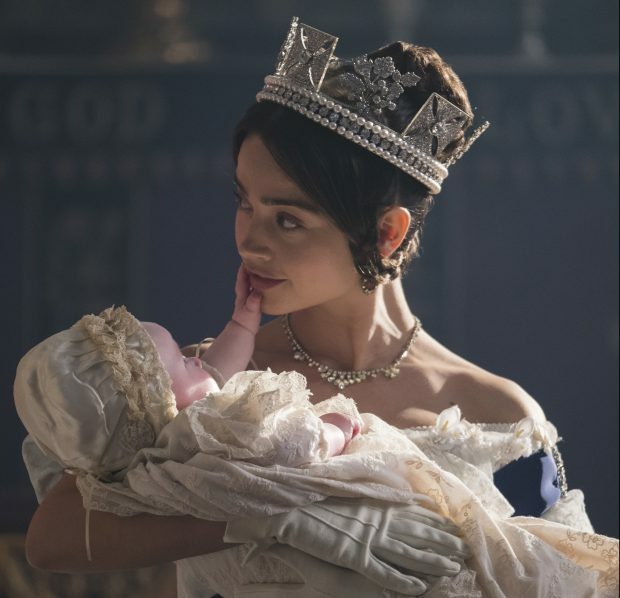 Which I guess is great for women with strong maternal instincts, but Victoria was definitely not one of those women, despite having birthed eight kids. At one point she confesses to her outgoing Mistress of the Robes, Harriet, that she’s really not that keen on her own kid. The real Victoria was known to call her own children quite ugly as babies and wasn’t interested in them until they got a fair bit older. And even then she wasn’t all that motherly to some of them. Not that all household matters are beyond Victoria’s concern. She notices that the food at Buckingham Palace has gone waaaaaay downhilll since Francatelli left, and she puts out the order for him to be made to return. Skeritt, who’s been abruptly promoted to head dresser, is dispatched to fetch him, but to say he gives her the brush off is an understatement akin to saying a lobster gets a nice steam facial. He tells Skeritt to get lost, and then for reasons we’re not at all privy to, goes back to BP anyway. But he makes it clear he’s not interested in even being civil to Skeritt, who runs off to cry about it for a while. I confess, I still have zero investment in this particular plotline. Also! Victoria has a new Mistress of the Robes: the Duchess of Buccleuch (pronounced Buck-loo, because of course it is). She’s played by Dame Diana Rigg, who has some extra time on her hands now she’s no longer needed on Game of Thrones. Much as I love Dame Di, her presence here is just bizarre, since the duchess was 31 years old when she joined Victoria’s retinue. She’s also played as this rather odd, ridiculous, bitchy woman, which isn’t at all what the actual duchess was like. She and Victoria were lifelong friends and Victoria always praised her as being a very clever, lovely woman. Strange. And she comes with a niece who’s extremely awkward and makes doe eyes at Ernst a lot. Yes, Ernst is back (yay!). He, Uncle Leopold, and his and Albert’s dad show up for the christening, bringing along Albert’s dog. I guess the dog was some sort of reward for Albert knocking out an heir so quickly. Leopold, as he is wont to do, starts meddling, urging Victoria and Albert to consider marrying their daughter into the Prussian royal family at some point in the future. Victoria’s adamant that her daughter will choose her own spouse, as Victoria herself did. Historically, she has it kind of right: Vicky would choose her own spouse the way her mother did–by going for essentially the only viable option presented to her. Oh, she and her husband were happy together, which was great, but little Vicky was only 14 years old when she agreed to marry him, so I think it’s fair to say she caved a bit to pressure and didn’t really know what she was getting into. Albert’s agitating for some kind of reform. He thinks officers should be chosen for ability, not how genial they are in the mess, and he goes on at length about redoing helmets and uniforms. Victoria, being kept in the dark here, is like, ‘but the uniforms are pretty!’ Eventually she finds out what’s going on and she is mad about it being kept from her. Like, throwing things at Albert mad. Ernst helps smooth the troubled waters by pointing out to his brother that Victoria is not likely to enjoy feeling like she’s being controlled. ‘Let her, you know, queen and things’ll likely be fine,’ he advises. Good old Ernst! During the christening, the worst news comes from Afghanistan: the troops have been massacred, and only one man out of more than 4,000 has survived. Victoria summons him, and he gives a tearful account of what’s happened. Victoria thanks him for his service, then slips into damage control mode. She decides to try and distract people a little from this horror by making herself more visible. She’ll be dedicating the new warship, Waterloo. Everyone’s against the idea, except for Wellington (of course!) but this is a woman who will have her way, so she goes. Not a bad start to the second series. Despite the tiresome belowstairs nonsense, I’ve enjoyed this more than most of what I saw last season. It feels like everyone’s finding their feet a bit more; Jenna Coleman especially seems to be treading the line between spoiled brat and damaged woman fairly well, which isn’t easy. So, we’ll see how this unfolds. I’m glad I’m not the only one with little interest in the storyline with Skeritt. They could certainly find something more engaging in a “Downstairs” storyline.